Image: Skypics studio/Getty Images. DacianG/ Getty Images. Design: Ashley Britton/SheKnows. At my daughter’s public elementary school last year, perfect attendance was pushed hard, and for good reason; schools are funded based on attendance figures. Each absence equals a financial loss. But is bribing or rewarding students for coming to school an appropriate tactic? After all, children are not in control of when they arrive or whether they stay home sick. (And speaking of sick, shouldn’t they keep those germs contained at home anyway?) In my opinion, rewarding kids for school attendance is awful and damaging — and it needs to stop. It’s time to put a stop to the ceremonies, privileges and trinkets given to kids simply for showing up. For one thing, this is rewarding children for things beyond their control. My 5-year-old is not in charge of whether she gets to school on time; I am. For older kids who miss the bus and thus the school day? We have no idea what’s going on in their homes. Maybe they were late to the bus that morning because they were busy caring for a sick sibling — or maybe they’re under the weather themselves. Because that’s another thing: If my kid is sick, she isn’t the one to decide whether she goes to class or stays home. And yet, schools bribe kids with prizes to get to school come what may — as if little kids were entirely in charge of their own schedules and immune systems. If I, the adult in this scenario, couldn’t get it together some morning with two kids in tow to get my kindergartener to class on time, she would be the one to miss out on an award, not me. My daughter’s friend has a compromised immune system, which means more missed days — which means sitting out “attendance parties” and being passed over with the congratulatory erasers. “I worry that those incentives will have kids come to school when they should stay home, putting my child and others at risk,” the girl’s mom told me. And should any kid be denied a slap bracelet because they were home with the flu? Ironically, if my daughter weren’t feeling well at school, I’d get a call from the office to come and pick her up. So do they want kids to go to school sick or not? Can’t they make a decision? Surely, most kids get sick at least once during the year. And most rational people would agree that you shouldn’t send an unhealthy child to school lest they spread their illness. So, isn’t it inappropriate to expect — and even reward — students for showing up when they’re ill? Indeed, the Los Altos School District, for instance, lists fevers, chills, vomiting and other symptoms as signs you should keep your kid at home. And according to TK, children have about 6 to 10 colds per year. So what’s with the unrealistic expectation that students come to school every single day? Mixed messages and misplaced blame aside, these attendance rewards actually don’t even work. According to a study published by the Harvard Kennedy School of Government, promised incentives actually make no difference in actual attendance rates. 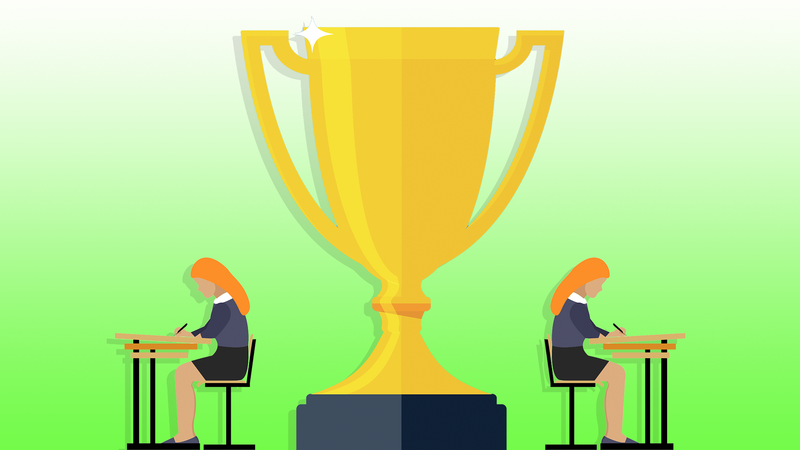 The BBC reports that the study of over 15,000 California secondary students shows that in some cases, attendance awards can actually make absenteeism worse. The Washington Post reports that attendance-based funding has myriad negative outcomes, including schools being forced to keep violent students in order to get their daily payout. And attendance-based funding hurts high-poverty areas — where more single-parent households often translate to higher truancy rates — the hardest. Regardless of how often their students are absent, schools still have to pay the same bills and salaries because staffing is based on total enrollment. Of course, it’s good for students to show up more often; better attendance is predictive of higher graduation rates, for one thing. But attendance award programs don’t work, and they’re not fair. So, it’s high time we retired this tired tactic. And instead of rewarding children for their health or for their parents’ ability to hustle them to class, perhaps efforts should be focused on the actual education going on. Or maybe school funding shouldn’t be based on attendance at all.